We’d love your help. Let us know what’s wrong with this preview of The Day the Falls Stood Still by Cathy Marie Buchanan. Tom Cole, the grandson of a legendary local hero, has inherited an uncanny knack for reading the Niagara River's whims and performing daring feats of rescue at the mighty falls. And like the tumultuous meeting of the cataract's waters with the rocks below, a chance encounter between Tom and 17-year-old Bess Heath has an explosive effect. When they first meet on a trolley p Tom Cole, the grandson of a legendary local hero, has inherited an uncanny knack for reading the Niagara River's whims and performing daring feats of rescue at the mighty falls. And like the tumultuous meeting of the cataract's waters with the rocks below, a chance encounter between Tom and 17-year-old Bess Heath has an explosive effect. When they first meet on a trolley platform, Bess immediately recognizes the chemistry between them, and the feeling is mutual. But the hopes of young love are constrained by the 1915 conventions of Niagara Falls, Ontario. Tom's working-class pedigree doesn't suit Bess's family, despite their recent fall from grace. Sacked from his position at a hydroelectric power company, Bess's father has taken to drink, forcing her mother to take in sewing for the society women who were once her peers. Bess pitches in as she pines for Tom, but at her young age, she's unable to fully realize how drastically her world is about to change. Set against the resounding backdrop of the falls, Cathy Marie Buchanan's carefully researched, capaciously imagined debut novel entwines the romantic trials of a young couple with the historical drama of the exploitation of the river's natural resources. The current of the river, like that of the human heart, is under threat: "Sometimes it seems like the river is being made into this measly thing," says Tom, bemoaning the shortsighted schemes of the power companies. "The river's been bound up with cables and concrete and steel, like a turkey at Christmastime." Skillfully portraying individuals, families, a community, and an environment imperiled by progress and the devastations of the Great War, The Day the Falls Stood Still beautifully evokes the wild wonder of its setting, a wonder that always overcomes any attempt to tame it. But at the same time, Buchanan's tale never loses hold of the gripping emotions of Tom and Bess's intimate drama. The result is a transporting novel that captures both the majesty of nature and the mystery of love. To ask other readers questions about The Day the Falls Stood Still, please sign up. This is my debut novel. Hope you love it. On the shelves September 2009 in Canda and the US and February 2010 in the UK and Italy. What's is about? Read on. Steeped in the intriguing history of Niagara Falls, this is an epic love story as rich, spellbinding and majestic as the falls themselves. 1915. The dawn of the hydroelectric power era in Niagara Falls. Seventeen-year-old Bess Heath has led a sheltered existence as the youngest daughter of the director of the Niagara Power Company. After gradua This is my debut novel. Hope you love it. On the shelves September 2009 in Canda and the US and February 2010 in the UK and Italy. 1915. The dawn of the hydroelectric power era in Niagara Falls. Seventeen-year-old Bess Heath has led a sheltered existence as the youngest daughter of the director of the Niagara Power Company. After graduation day at her boarding school, she is impatient to return to her picturesque family home near Niagara Falls. But when she arrives, nothing is as she left it. Her father has lost his job at the power company, her mother is reduced to taking in sewing from the society ladies she once entertained, and Isabel, her vivacious older sister, is a shadow of her former self. She has shut herself in her bedroom, barely eating—and harbouring a secret. The night of her return Bess meets Tom Cole by chance on a trolley platform. She finds herself inexplicably drawn to him—against her family’s strong objections. He is not from their world. Rough-hewn and fearless, he lives off what the river provides and has an uncanny ability to predict the whims of the falls. His daring river rescues render him a local hero and cast him as a threat to the power companies that seek to harness the power of the falls for themselves. As their lives become more fully entwined, Bess is forced to make a painful choice between what she wants and what is best for her family and her future. A love story centered around the early 1900s when men in power were determined to harness the power of the mighty Niagara with hydroelectric power plants. Tom Cole has loved the river his entire life but also loves Bess. A love which will lead him to compromise his personal beliefs and convictions because the only way he can support his family is by working for the company that is against everything he believes in. Bess is also divided in her heart over her need for financial security versus the A love story centered around the early 1900s when men in power were determined to harness the power of the mighty Niagara with hydroelectric power plants. Tom Cole has loved the river his entire life but also loves Bess. A love which will lead him to compromise his personal beliefs and convictions because the only way he can support his family is by working for the company that is against everything he believes in. Bess is also divided in her heart over her need for financial security versus the need to support and believe in what makes her husband the man he is. The choices and sacrifices they make will have profound consequences. The well researched and supported history is a relevant and interesting storyline in light of these current times when movements are starting up all over the United States to remove dams that seemed like a good idea at the time but exacted great losses to our natural scenic treasures and wildlife. It’s told from the Canadian viewpoint and brought to mind John Muir’s heartbreaking battle to save the Hetch Hetchy Valley in Yosemite. I can't help but include one of his quotes. Overall a touching, educational, and satisfying read. 4.5 rounded up to 5. One of the greatest pleasures of reading is to be unexpectedly wrapped up in a book. On the flip side there’s the disappointment of over-hyped books that do not deliver for the reader. There are many books I have not read for fear of such a reaction, and then there are these other books that come along less frequently. They make me suspend disbelief and wrap me up in another time, another life, another level of reality. Such was my reading experience in this book. The charact 4.5 rounded up to 5. Such was my reading experience in this book. The characters were a bit too good to be true, it wasn’t chock full of quotable passages, and it doesn’t do anything particularly fresh. But it carried me away like the fast-flowing waters of the Niagara River. I want to set the story up but give nothing away, so in brief, the story is set on the Canadian side of the falls from 1915-1923. The development of hydro-electric power provides much-needed jobs and the convenience of electricity, but also irrevocably changes the river, much to the dismay of Tom Cole, whose father has provided him with a sixth-sense type of knowledge of the river, the falls, the ice and all of its dangers. The narrator, Bess is from privileged society, her father providing well given his position in the hydro-power industry. But WWI comes along and changes industrial needs, makes his aluminum dreams for the company a near disaster and costs, him his job. His family’s financial situation become a shambles. The story hinges on Bess and Tom. I feel I’ve done an injustice by not making the book sound more interesting or literary. But Buchanan is a more than capable writer, with just enough descriptive detail of place and daily life always given and just enough insightful thought revealed to make you wonder what action Bess will take. Just enough foreshadowing constantly compelled me on. But doggone it, to say much more would spoil the fun of reading it. I recommend it to readers who enjoy historical fiction with strong, female characters, tragedy and, of course, romance. I recieved this book as a review copy from the publicist. Started out very interesting, but I am putting it away halfway through. It was too depressing. A suicide, girl who's life is spiraling downward and sexual content I didn't want to read. The book has an overall sad tone though it is poetic. This is the first novel by the author of the wonderful The Painted Girls, and it is a lovely one indeed. I seem to have developed a literary crush on Cathy Marie Buchanan, her novels really sit quite well with me. Though this novel is much quieter than her next one, it is the simple sort of tale that rivals such works as Brooklyn by Colm Toibin and Someone by Alice McDermott. This is not the novel for those that need lots of tension and foreshadowing. It flows like the Niagara River on which it This is the first novel by the author of the wonderful The Painted Girls, and it is a lovely one indeed. I seem to have developed a literary crush on Cathy Marie Buchanan, her novels really sit quite well with me. Though this novel is much quieter than her next one, it is the simple sort of tale that rivals such works as Brooklyn by Colm Toibin and Someone by Alice McDermott. This is not the novel for those that need lots of tension and foreshadowing. It flows like the Niagara River on which it is based, with a bit less turbulence. With the exception of a couple of river rescue scenes, there is not a whole lot of excitement in this tale. It takes place from 1915 - 1923 on the Canadian side of the great falls, and I saw it basically as a sort of love story of this wonder of the world. Iris is enrolled in a private school. The summer of her 17th birthday, her world totally changes due to 2 significant events. One I will not divulge, the other being meeting Tom Cole, The book reveals their meeting and subsequent romance. This is not of the bodice ripping, overly dramatic kind, which I greatly appreciated. Though there is passion, the author chose a more practical approach to their relationship. She made it so real and so very much of the times. Two very important themes that are dealt with here are the negative effects of establishing power companies on the strength and volume of the river that goes over the falls, and the questioning of the supposed unquestioning belief in God (what some call faith). People who are devout might have some problem with the development of the narrator on these terms--I found it extremely intelligent and grounded. We live in an age where nearly all of our threats are human. Nature has no recourse against man-made factories, bridges, levees, and weapons. We are safe. We are secure. In the middle-north of the country, though, nestled between the United States and Canada is a reminder that we are human but only human. When I was a little kid I fell in love with Gordon Lightfoot’s Wreck of the Edmund Fitzgerald. There is something helplessly beautiful and tragic about the power and majesty evoked by lore surr We live in an age where nearly all of our threats are human. Nature has no recourse against man-made factories, bridges, levees, and weapons. We are safe. We are secure. In the middle-north of the country, though, nestled between the United States and Canada is a reminder that we are human but only human. When I was a little kid I fell in love with Gordon Lightfoot’s Wreck of the Edmund Fitzgerald. There is something helplessly beautiful and tragic about the power and majesty evoked by lore surrounding the Great Lakes basin. While not as factual as Lightfoot’s recount, Cathy Marie Buchanan’s The Day the Falls Stood Still succeeds in capturing the breathtaking spirit of the rivers and lakes that contain the unshakable spirit in the heart of the north. What begins as a typical society girl’s junior year at a local prep school on the Canadian side of the falls, becomes a heart wrenching love story between man and woman but also between mankind and the river. Set in the early to mid twentieth century, the story is told through the eyes of seventeen-year-old Bess Heath, the second and youngest daughter of a man who, prior to the beginning of the story, has been a social and financial success in the hydro-electric efforts in town. Immediately before Bess returns home for the summer, her father runs into a bit of trouble when a prediction fails to bring success to his fellow businessmen. He is let go from the industry and sets in motion a drama that rolls forward like a stack of dominoes. Caught in the inevitable social recourse of her parents’ plummeting social stature Bess and her sister Isabel are left to wonder what their glitzy upbringing has prepared them for and where to turn. Amidst the downfall of the industrial elite, there is a softer voice. The voice of the river slips quietly through town, in the form of Thomas Cole, grandson of a famous river man who was more river than man, metaphysically and physically. In a melding of two worlds, Bess and Tom find their lives intertwined in ways that challenge both the unstoppable progress of the hydro era and the fading grandeur of the water that is their livelihood. To say that this is a historical fiction romance is to completely miss the point. There is history, steeped in incredible drama, which found me at my computer in the wee hours of the morning, searching for more tidbits about the period. And, of course, there is the love story, both believable and magical. However, those two things are not the elements that drive this book. It is Buchanan’s complete dedication to inviting her readers to fall in love with the falls, to imagine themselves there, wading waist deep in the stories, the tragedy and the beauty. This is a magical, well told tale about a young woman named Bess, a riverman named Tom, and the history of the Niagara Falls. Bess meets Tom at the beginning of World War One when her family has fallen on hard times. They both reside on the Canadian side of the Niagara Falls in a town being overcome by hydroelectric power plants. Bess comes from a family that made its riches from the power plants, whereas Tom strongly believes in the beauty of the river and leaving nature untouched. This differe This is a magical, well told tale about a young woman named Bess, a riverman named Tom, and the history of the Niagara Falls. Bess meets Tom at the beginning of World War One when her family has fallen on hard times. They both reside on the Canadian side of the Niagara Falls in a town being overcome by hydroelectric power plants. Bess comes from a family that made its riches from the power plants, whereas Tom strongly believes in the beauty of the river and leaving nature untouched. This difference in opinion, however, does not deter their feelings for each other. Partly due to her family's financial struggles, her father's loss of a job, but mostly her sister's suicide, Bess transforms from a gullible, naive girl to a strong, independent woman almost overnight and against her family's wishes, she marries Tom. After he serves his time in the war, they start a family and Tom faces difficult choices and must make decisions that go against his personal beliefs. Tom loves the river, but the only jobs available are involved in the destruction of it and his beloved falls. What will come first in his priorities, his family or his ethics? In between the romance and Tom's amazing river rescues, readers get a detailed story about the Falls and the power plants that set out to destroy it. There are wonderful pictures, newspaper articles, and factual tidbits in between chapters. I found this particular touch very charming. I love Niagara Falls, every time I visit I am completely awestruck. It is an amazing wonder to behold, it's literally breath taking. If you have never been I would urge you to go. I have seen much of the landscape the author describes in this book and I remember some of the folk lore from my many visits. My family and I saw Jay Cochrane walk a tightrope to the Skylon Tower in 2005. Niagara Falls has a magic and wonder that is hard to describe. I really enjoyed this novel that incorporates so much I love Niagara Falls, every time I visit I am completely awestruck. It is an amazing wonder to behold, it's literally breath taking. If you have never been I would urge you to go. I have seen much of the landscape the author describes in this book and I remember some of the folk lore from my many visits. My family and I saw Jay Cochrane walk a tightrope to the Skylon Tower in 2005. Niagara Falls has a magic and wonder that is hard to describe. I really enjoyed this novel that incorporates so much of the history and folk lore of the Falls. I liked the literary references, the history of the falls and the conflict over harnessing their power. Buchanan creates likeable and sympathetic characters in Tom Cole and Bess Heath. She paints a tender portrait of their courtship and a realistic one of their life together after they are married and Tom returns from World War I. The story is compelling enough to make it a quick read and the writing is good enough to make it an easy one. There is a particular turn of events that seemed a little bit unlikely to me but I liked the story despite it. I thought the commentary on fashion and the economy and how it impacted dress making was interesting as were the dress making details themselves. There are plenty of period details that take the reader back in time. Overall an enjoyable and moving book that I would recommend. 10 july 2015 -- maybe 4.5 3.5-stars. what a wonderful, sensitive, evocative novel. i am leading a group read of this book during july, so will hold off on a longer review for now, until our discussions wrap up at the end of the month. but, i will say that i have been in a real run of so-so or 'meh' reads in 2015. to be so engrossed and captivated by a story was such a treat right now. the group chat for the novel has already added nicely to the read. 26 july 2015 -- lowered rating. as time has p 10 july 2015 -- maybe 4.5 3.5-stars. what a wonderful, sensitive, evocative novel. i am leading a group read of this book during july, so will hold off on a longer review for now, until our discussions wrap up at the end of the month. but, i will say that i have been in a real run of so-so or 'meh' reads in 2015. to be so engrossed and captivated by a story was such a treat right now. the group chat for the novel has already added nicely to the read. Sometimes a book just wraps you up inside its covers and you don't recognize the regular world when you look up. That is what happened to me and this story. Bess Heath is a boarding school girl used to a better class of life but when her father is laid off from work they must all pitch in. Bess is 17 and a marriage to the right boy would help the family but the young river man holds her attention. The characters are interesting and life-like in this story of love and death and progress versus nat Sometimes a book just wraps you up inside its covers and you don't recognize the regular world when you look up. That is what happened to me and this story. Bess Heath is a boarding school girl used to a better class of life but when her father is laid off from work they must all pitch in. Bess is 17 and a marriage to the right boy would help the family but the young river man holds her attention. Sorry, Goodreads author. This book struggles in many ways, and I'm not going to finish it. My biggest issue is the anachronistic dialogue. I'd like to read a book about the small but heroic efforts of women making it on their own in 1915, where cooking and sewing are the domestic skills that empower them, but it's not enough to keep this novel alive. Bess's attraction to Tom is trite and predictable, and the historical references feel like slaphazard inserts thrown in after the first draft was w Sorry, Goodreads author. This book struggles in many ways, and I'm not going to finish it. My biggest issue is the anachronistic dialogue. I'd like to read a book about the small but heroic efforts of women making it on their own in 1915, where cooking and sewing are the domestic skills that empower them, but it's not enough to keep this novel alive. Bess's attraction to Tom is trite and predictable, and the historical references feel like slaphazard inserts thrown in after the first draft was written. Bess doesn't take us anywhere new; nor does Buchanan's writing. I picked this book up because I had just been to Niagara Falls and thought it would be a neat connection. But I couldn't get past the first 100 pages (of a 300 page book). So I looked at some online reviews and everyone said it is really good in the beginning and gets slow in the middle, with a disappointing ending. Since I absolutely forced myself for the "good" 100 pages, I hung it up. "Too many books, so little time". I’ve had the opportunity to visit Niagara Falls several times over the years, but I knew very little about its history, especially during the early days of hydro-electricity in Canada. I appreciated how the author fused the prominent issues of that time into the story. It explored the environmental and moral sacrifices these advances brought. Buchanan crafted a fictional story that was inspired by the real life River Man William “Red” Hill and his heroic rescues. I enjoy when a historical fiction I’ve had the opportunity to visit Niagara Falls several times over the years, but I knew very little about its history, especially during the early days of hydro-electricity in Canada. I appreciated how the author fused the prominent issues of that time into the story. It explored the environmental and moral sacrifices these advances brought. Buchanan crafted a fictional story that was inspired by the real life River Man William “Red” Hill and his heroic rescues. 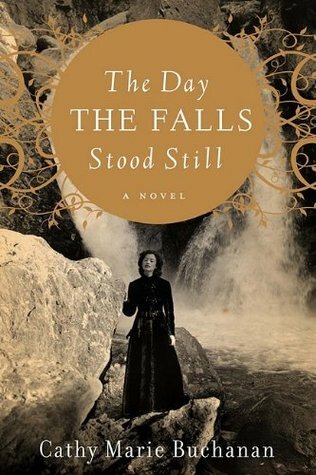 I enjoy when a historical fiction gives the reader a good image of how daily life was during a specific time period and I felt The Day the Falls Stood Still did just that. It took me some time to really get into the story. It wasn’t until the end that I really understood what drew Bess and Tom together. However once I was hooked, I became very immersed in the plot. I also liked the old photographs that began each section. This book had everything, a beautiful setting, a love story, cultures and classes clashing, occult overtones, but ultimately it was disappointing. I kept wondering what the author's point was. Sometimes, if the story is engrossing enough, meandering can be forgiven but Buchanan's writing showed seams badly and her characters went in and out of focus, sometimes feeling real then fading into caricatures. Rather than speaking their frustration, confusion, anger, etc. Buchanan repeatedly had them "o This book had everything, a beautiful setting, a love story, cultures and classes clashing, occult overtones, but ultimately it was disappointing. I kept wondering what the author's point was. Sometimes, if the story is engrossing enough, meandering can be forgiven but Buchanan's writing showed seams badly and her characters went in and out of focus, sometimes feeling real then fading into caricatures. Rather than speaking their frustration, confusion, anger, etc. Buchanan repeatedly had them "open their hands, palms up". Not sure why I hadn't realized this was a historical novel before embarking on it. Luckily the OD on historical novels that happened in 2011 has faded in my memory and I was able to enjoy it for a variety of reasons - the lush prose, the profundity of some of the observations (particularly those relating to cumulative grief and loss, of which there is a lot in this book - loss of hope, loss of life, loss of opportunity, financial loss, as well as loss of integrity which to some is merely comprom Not sure why I hadn't realized this was a historical novel before embarking on it. Luckily the OD on historical novels that happened in 2011 has faded in my memory and I was able to enjoy it for a variety of reasons - the lush prose, the profundity of some of the observations (particularly those relating to cumulative grief and loss, of which there is a lot in this book - loss of hope, loss of life, loss of opportunity, financial loss, as well as loss of integrity which to some is merely compromise). I enjoyed this book, which included a partial history of Niagara Falls at the time of electrical development. The falls are described in such detail and force that they are a character in the story. I found, though, that the real people weren't as solid or powerful as the falls. There's so much woe, bad luck and depression in this story. It seems overdone because it is never-ending. Bess had hardship, yes, but also good times but even those are colored grey and sad....always with a cover of fore I enjoyed this book, which included a partial history of Niagara Falls at the time of electrical development. The falls are described in such detail and force that they are a character in the story. I found, though, that the real people weren't as solid or powerful as the falls. There's so much woe, bad luck and depression in this story. It seems overdone because it is never-ending. Bess had hardship, yes, but also good times but even those are colored grey and sad....always with a cover of foreboding. Enjoy Life, Bess! I spent the time waiting for the big disaster to happen. It was so obvious with all the depression and woe that a disaster had to happen. A little bit of surprise and suspense would have been appreciated. A good story but a depressing one throughout. Really loved all the information I got about Niagara Falls and that the story was set there. Beautiful but deadly settings. I did not love this book as I did The Painted Girls but I did enjoy the book. . I was not as invested in the main characters as I was in her other book but I still very much enjoyed it. I love Canadian authors do not ask me why but the ones I have read most of the time write great books as does Cathy Marie Buchanan.Sometimes I wondered what the point was but I guess the mor Really loved all the information I got about Niagara Falls and that the story was set there. Beautiful but deadly settings. I did not love this book as I did The Painted Girls but I did enjoy the book. . I was not as invested in the main characters as I was in her other book but I still very much enjoyed it. I love Canadian authors do not ask me why but the ones I have read most of the time write great books as does Cathy Marie Buchanan.Sometimes I wondered what the point was but I guess the moral of this story is do not try to change someone in someone he/she is not just because of money. Definitely going to read her next books. I've become a bit of a fan. Loved this book! Best book I have read so far this year. I really felt what it might have been like to live in Niagara Falls, Ontario in the very early 1900's. The characters were so real, I felt like I was right there alongside them, and the falls, as I read. If you like historical fiction, you must read this book. I plan on recommending this to all my friends! This is a must read for anyone who loves historical fiction, great character development. I smiled, I sobbed. I never wanted it to end. I haven't felt so emotionally connected to a book since reading Margaret Atwood's Alias Grace. Although heartbreaking this story is very well-written. It will stay with me for a very long time. Set in Canada during the WWI years, this story centers around Bess Heath and her family's life in Niagara Falls. Their privileged lives have taken a turn toward reduced circumstances, after Bess's father loses his job with the power company. Her mother now must sew and take dress orders to make a living; her sister Isabel's recently broken engagement has left a scar on the whole house. When Bess meets riverman Tom Cole, she begins to make decisions for herself, knowing the consequences will be d Set in Canada during the WWI years, this story centers around Bess Heath and her family's life in Niagara Falls. Their privileged lives have taken a turn toward reduced circumstances, after Bess's father loses his job with the power company. Her mother now must sew and take dress orders to make a living; her sister Isabel's recently broken engagement has left a scar on the whole house. When Bess meets riverman Tom Cole, she begins to make decisions for herself, knowing the consequences will be difficult, but willing to bear them. For the most part, this was a beautiful novel. Buchanan made the river and the falls a character itself with her writing. She captured the post-war struggles of men and women finding (or re-discovering) their places and roles in society and the home. However, I had a hard time with Bess and her antipathy toward God as the book goes on. Tragedies happen - therefore, there is no God. Her faith, what it was, was very shallow; it had no roots. She was often unlikeable. I understood Tom better. The other problem was that I had no idea about any of the history behind hydroelectric power at Niagara Falls and any of the controversies and issues surrounding its use. I was surprised that the author did not include any additional history or backstory in her note, only the inspiration for Tom Cole's character. The Day the Falls Stood Still is a very promising debut novel by Cathy Marie Buchanan. The story is set in Canada near the Niagara where its wonderful beauty and history is emanated from Cathy's descriptions. This is the story of Bess Heath, who suddenly finds herself at a turning point in her life when everything is forced to change due to the fact that her father lost his job at the power plant. Bess's mother, father and sister are intriguing characters along with Bess herself, and we immediat The Day the Falls Stood Still is a very promising debut novel by Cathy Marie Buchanan. The story is set in Canada near the Niagara where its wonderful beauty and history is emanated from Cathy's descriptions. This is the story of Bess Heath, who suddenly finds herself at a turning point in her life when everything is forced to change due to the fact that her father lost his job at the power plant. Bess's mother, father and sister are intriguing characters along with Bess herself, and we immediately get drawn into this captivating telling of this family's journey. There are quite a few supporting characters as well, each adding depth and drama to this story as Bess must make difficult choices that end up haunting her family, which cast her as a strong and brave woman. Mr. Heath, Bess's father, loses his long-time job at the hydroelectric plant which puts the family into a downward spiral of economic hardship and despair. Although set in 1915, the modern economic times also mirrors the struggles that the Heath family faced back then, and they also had the war to deal with. Mr. Heath shuts his family out, Mrs. Heath can do little to get him out of his self-induced funk, and Bess's treasured sister Isabel is going through her own personal crisis. And through it all, Bess is watching trying to add strength to her family, as she is trying to adjust to a new way of life after her father loses his job. A light at the end of the tunnel is when the son of a prominent family member proposes to Bess, but Bess has fallen in love with a fishmonger of whom her family strongly disapproves. And then suddenly a horrifying tragedy occurs, sending the family into an emotional spiral of grief and depression and further forces the family into the speculative limelight of gossipers. How Bess and her family deal with this tragedy is portrayed simply, but it is told with a distinct grip of grief that is significant of excellent writing that resonates throughout the novel. All the while through this story of Bess and the trials of her family, Bess goes through her own life events of marriage, career and children which makes the book a sort of romance in the beginning; but all is told with the Niagara as an integral part to the novel and not just as a backdrop. The story of the man, Fergus Cole, who previously was a renowned riverman known for daring river rescues at the Falls, is the undercurrent in the story with interesting anecdotes about him and his rescues, which also makes the book a sort of historical. The author was inspired for this novel by the true riverman William "Red" Hill, and the rescues are depicted in the novel as well. It is cleverly portrayed through newspaper clippings along with inspiring old photos of the Falls themselves. The residents of the area were caught between the controversy of technology and development versus the preservation of the sanctity of the Falls and the river, and serves as a theme throughout this novel as Bess finds herself right in the middle of the issues. This is an informative look on the impact of both the electric powerhouses of the times, and the majestic force of the Niagara. The story moves swiftly and is sadly poignant but engrossing all the same. Giving the novel an even more realistic flavor is the attention given to the dressmaking projects that Bess takes on, as this is how many women helped to support the family in the days of WWI. The few criticisms I have is that the book ended, and that the back cover exposes a major turning point in the book that should not have been given away on the back cover (which will not be divulged here). This is not for the weak of heart as it is certainly not a happy-joy-joy type of book. The ending leaves you feeling bereft through its heart wrenching details, but this makes for a compelling read and I recommend it for the main character's fortitude and strength. I look forward to future works by Cathy Marie Buchanan, so that I can again relive the intense drama that she writes. I'm a sucker for anything waterfall-related, fictional, non-fictional or pictorial, so Buchanan had me at "hello" with this quite charming historical novel of a middle-class World War I era young woman on the Canadian side of Niagara Falls. Her family hits hard times almost exactly at the same time as she falls for a young man - fictional name Tom Cole, but he is a reworking of an actual historical figure, a riverman named William "Red" Hill - who is knowledgeable about, and a passionate advocat I'm a sucker for anything waterfall-related, fictional, non-fictional or pictorial, so Buchanan had me at "hello" with this quite charming historical novel of a middle-class World War I era young woman on the Canadian side of Niagara Falls. Her family hits hard times almost exactly at the same time as she falls for a young man - fictional name Tom Cole, but he is a reworking of an actual historical figure, a riverman named William "Red" Hill - who is knowledgeable about, and a passionate advocate for, that part of the Niagara River that flows through the famous falls and gorge. However, she gives her hero (and he really is a hero in the best fictional romance tradition) a different set of circumstances, and the ending of the novel will not please all readers. I quite liked the ending, but I won't say more for fear of spoiling. For me, a major part of the enjoyment of this novel was the re-telling of a number of famous anecdotes about the Niagara Falls of Tom's generation, and that of his grandfather of the mid 19th-century. It was in the 1840s, in fact, that "the Falls stood still" because of an ice jam in Lake Erie, and Tom's grandfather, like Tom himself, had much ado to save the lives of fools who at various times (including that one) did not respect the enormous power and danger of the river. In fact, the cumulative effect of the anecdotes in this book - those I knew and those I didn't - was to confirm my impression that Niagara Falls stunters and barrel-riders are, to the man and woman, prime candidates for the Darwin Award. The main action of the novel coincides in time with the beginning of the exploitation of Niagara for hydro-electric power, and also the beginning of the argument (which will never fully die, though it appears to have been quieted by an international agreement ca. 1950) over how much water can be removed from the river for industrial purposes - and how much by each country, since it's an international river - without compromising the truly iconic nature of the Falls as a tourist attraction. Tom, who identifies with the river at a visceral level, is of course an opponent of the development, and he has allies to this day; Bess, his wife and our narrator-protagonist, is more centrally situated in the argument, being sympathetic to Tom but the daughter of a power-plant manager (albeit one who loses his job). Bess is also a seamstress (it's how she keeps her little family going while Tom is away fighting in the gruesome battles of WWI - and thereafter, as he struggles to find work) and, for my taste, a little too much of her narrative is concerned with dressmaking details - but that's nitpicking. The dressmaking has a function in linking up the various female characters of the plot, it moves the story forward in a couple of places, and some of the detail is helpful in establishing the historical feel of the novel - it's as legitimate in that respect as the horrible details of trench warfare that Tom brings home with him. Reason for Reading: The book takes place in Niagara Falls, Canada and that is where I live plus the historical time 1915-1923 is a favourite period I like to read about. I was excited to read a book set in my city and the cover is beautiful and actually blew me away when I saw it in real life. Comments: I'll start off by admitting I may be a little biased. There is something captivating about reading a book when you recognize the street names, know the buildings mentioned, have been to the natur Reason for Reading: The book takes place in Niagara Falls, Canada and that is where I live plus the historical time 1915-1923 is a favourite period I like to read about. I was excited to read a book set in my city and the cover is beautiful and actually blew me away when I saw it in real life. Comments: I'll start off by admitting I may be a little biased. There is something captivating about reading a book when you recognize the street names, know the buildings mentioned, have been to the natural landmarks and live a block away from the church the family attended. But when I also find myself reading a brilliant epic love story I think my insider knowledge is more of a bonus than a bias. Bess and Tom come from different classes. Bess is the 17yo daughter of an influential man at Niagara Power and lives in Glenview Mansion. She attends a Catholic Girls Academy (even though the family isn't Catholic) and leads a sheltered life. Tom is about 22 and is the local riverman. He catches fish for pay, pulls dead bodies out of the river, works a few nights in the saloon he has a room over and is always on hand when help is needed down at the river. When these two meet each other it is love at first sight but many things stand in their way including themselves. While the beautiful love story is the main plot there are many other themes running through the book. The plight of women during this period is masterfully woven into the story with unwed pregnancy, suicide, women working during the war, and women being given the vote during WWI if they had a husband or son overseas. The effect the war had on the women as they stayed home and wondered if their husbands would ever come home and the plight of the men who did come home who were wounded beyond repair and others who had unseen wounds, those of the mind that don't heal so easily. It is also a story of the environment as the whole history of the harnessing of the power of the Falls for electricity takes place during this time period. Sir Adam Beck, the government, the big business and everyone else it seems is so excited about more and more electricity at less cost that nobody seems to know what it is doing to the river itself, nobody but Tom that is, who knows the river like the back of his hand, and what he sees scares and saddens him. The characters all stand out wonderfully but it is Tom, a true hero, who captures your heart. Have you ever been enjoying a treat, a cookie or a piece of pie, when the phone rang or someone knocked at the door? And while you are taking care of your interruption, your mind wanders back to that unfinished decadence and you pine to finish? That’s how I felt while reading the debut novel "The Day the Falls Stood Still" by Cathy Marie Buchanan. My days have been filled with thoughts of this story and I longed to get back to it each night. I know a story is truly great when my life is made up o Have you ever been enjoying a treat, a cookie or a piece of pie, when the phone rang or someone knocked at the door? And while you are taking care of your interruption, your mind wanders back to that unfinished decadence and you pine to finish? That’s how I felt while reading the debut novel "The Day the Falls Stood Still" by Cathy Marie Buchanan. My days have been filled with thoughts of this story and I longed to get back to it each night. I know a story is truly great when my life is made up of reading and the little details in between. "The Day the Falls Stood Still" is a story of life – a life filled with hardships, happiness, hard work and sacrifices. Set mostly on the Canadian side of the Niagara Falls in the years surrounding WWI, this was an informative book as well as a wonderful love story. Bess, the daughter of a recently financially ruined businessman is forced to deal with the changes this brings upon each member of her family. On the trolley coming home from her beloved boarding school Bess meets a young working-class man who is enthralled with the Niagara River. His name is Tom Cole, of Cole family fame. Tom’s grandfather was a local hero who rescued countless people from the river and seemed to have a feeling when things were going to happen. Tom inherited this special sense of the river. His soul is tied to the river and its health. The story of Bess, Tom and the river is an amazing endeavor; a delightful mixture of a Victorian love story, a coming-of-age novel and an important environmental history. This would be a great read for a book club or would make a wonderful present. Oh, and what a beautiful movie could be made! I learned so much from all of the details in this book. Bess becomes a dressmaker and the descriptions of the materials, colors and forms she uses was amazing. I would love to travel back in time to see firsthand the gorgeous dresses she made. I have never been to Niagara Falls but after reading Buchanan’s story I know in my mind the colors of the mist at the bottom of the falls, the roar of the water as it tumbles over and the strength of the whirlpool farther below. Um…wow. Make sure to check out Cathy’s website – one of the most beautiful author sites I have ever seen. There is an interactive map of the Niagara River Gorge that is amazing even if you haven’t read the book – and an invaluable resource if you have (especially if you haven’t visited Niagara Falls). The Day the Falls Stood Still is just pure lovely. A true decadence only an eclair could rival. I wish I could go back and experience it again. I must admit I purchased this book based on the cover which I thought looked fascinating. I was only a little bit disappointed. The "historical" part of the Falls was interesting and I enjoyed Bess' relationship with her sister, parents and Tom. However, I had a hard time following the more "technical" parts of the river: the eddys, currents, and the general setting of the river. I'm not familiar with the area (or big rivers in general), and some of that was just confusing to me. [Set against the I must admit I purchased this book based on the cover which I thought looked fascinating. I was only a little bit disappointed. The "historical" part of the Falls was interesting and I enjoyed Bess' relationship with her sister, parents and Tom. However, I had a hard time following the more "technical" parts of the river: the eddys, currents, and the general setting of the river. I'm not familiar with the area (or big rivers in general), and some of that was just confusing to me. This was an excellent novel based on the history or Niagara Falls at the turn of the century when the power plants and other industries were discovering the energy of the falls. Niagara Falls has a fascinating history and lots of colorful stories about those who has lived and died there through accidents and through stunts that have driven people to challenge the river. The main character is a young lady in a wealthy family who finds herself torn from society and comfort when her father loses his This was an excellent novel based on the history or Niagara Falls at the turn of the century when the power plants and other industries were discovering the energy of the falls. Niagara Falls has a fascinating history and lots of colorful stories about those who has lived and died there through accidents and through stunts that have driven people to challenge the river. The main character is a young lady in a wealthy family who finds herself torn from society and comfort when her father loses his position in the thriving industry of the power plants that were drawing from the river. The whole book is tangled in the history of the river as she meet and marries the "riverman" based on an actual person who lived saving lives from the river. I am somewhat biased because I grew up near Niagara Falls, NY, but I would have loved this book even if I was from Atlanta. The book is set on the Canadian side of Niagara Falls from 1915 to 1925. The main character, Bess, endures many successes and tragedies from the age of 17 until she is 26, when the book ends. Her privileged life is abruptly taken away from her, and everyone, including Bess, is pleasantly surprised by her perseverance. While there are frequent references to sacrificing becau I am somewhat biased because I grew up near Niagara Falls, NY, but I would have loved this book even if I was from Atlanta. The book is set on the Canadian side of Niagara Falls from 1915 to 1925. The main character, Bess, endures many successes and tragedies from the age of 17 until she is 26, when the book ends. Her privileged life is abruptly taken away from her, and everyone, including Bess, is pleasantly surprised by her perseverance. While there are frequent references to sacrificing because of the war, the major setting is Niagara Falls, which is very much a character in this book. The book invoked many feelings about Niagara Falls: awe of its majesty, fear of its power, and respect of its economic and social impact. This love story hits all the traditional major loves: love of your partner, parental love, and sibling love. Loss is also a major theme: the demise of loved ones, sacrifice for the war, loss of lifestyle. CATHY MARIE BUCHANAN’s The Painted Girls is a #1 National Bestseller in Canada, a New York Times bestseller, and has garnered rave reviews and been showered with special attention—everything from selection as a People Magazine pick to inclusion in Entertainment Weekly’s Must List to being named a best book of 2013 by NPR, Good Housekeeping and Goodreads. Her debut novel, The Day the Falls Stood St CATHY MARIE BUCHANAN’s The Painted Girls is a #1 National Bestseller in Canada, a New York Times bestseller, and has garnered rave reviews and been showered with special attention—everything from selection as a People Magazine pick to inclusion in Entertainment Weekly’s Must List to being named a best book of 2013 by NPR, Good Housekeeping and Goodreads. Her debut novel, The Day the Falls Stood Still, is a New York Times bestseller and a Barnes & Noble Recommends selection. She holds a BSc (Honours Biochemistry) and an MBA from Western University. Born and raised in Niagara Falls, Ontario, she now resides in Toronto with her husband and three sons.